Ellison: Iron Man or guru? 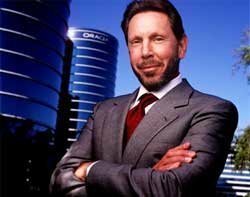 Larry Ellison is one of the richest men in the world, thanks to the reach of Oracle software, which seems to be in almost every government and major business around the world. He had the briefest of cameo roles in Iron Man 2, and Oracle managed to get a plug for its Exadata server in Iron Man 3, when a TV van appeared to be powered by the big data server.